» Why is preservative free and phosphate free important? Home » HYLO® » Why is preservative free and phosphate free important? Damage the cells of the eye surface. Destroy the natural tear film. Be the cause of intolerance reactions. Modern tear substitutes are entirely free of preservatives. Why is phosphate free important? Practically insoluble crystals can be formed due to the reaction with calcium (which is released from damaged cells of the eye surface) and can impair your vision. Eye drops that are used in dry eyes, particularly after eye surgery or injuries should not contain phosphate buffers. 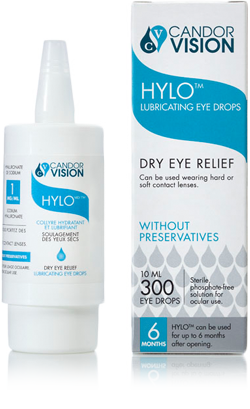 HYLO® / HYLO®DUAL / HYLO®Gel / OCUNOX® are entirely preservative and phosphate free and usually very well tolerated. CandorVision – Your eyes are everything!